The International Association of Public Transport (or UITP) defines metro systems as urban passenger transport systems, “operated on their own right of way and segregated from general road and pedestrian traffic”. The terms Heavy rail (mainly in North America) and heavy urban rail are essentially synonymous with the term “metro”. Heavy rail systems are also specifically defined as an “electric railway”. The dividing line between metro and other modes of public transport, such as light rail and commuter rail, is not always clear, and while UITP only makes distinctions between “metros” and “light rail”, the U.S.’s APTA and FTA distinguish all three modes. A common way to distinguish metro from light rail is by their separation from other traffic. While light rail systems may share roads or have level crossings, a metro system runs, almost always, on a grade-separated exclusive right-of-way, with no access for pedestrians and other traffic. And in contrast to commuter rail or light rail, metro systems are primarily used for transport within a city, and have higher service frequencies and substantially higher passenger volume capacities. Furthermore, most metro systems do not share tracks with freight trains or inter-city rail services. It is however not relevant whether the system runs on steel wheels or rubber tyres, or if the power supply is from a third rail or overhead line. The name of the system is not a criterion for inclusion or exclusion. Some cities use metro as a brand name for a transit line with no component of rapid transit whatsoever. Similarly, there are systems branded light rail that meet every criterion for being a rapid transit system. Some systems also incorporate light metro or light rail lines as part of the larger system under a common name. These are listed, but the light rail lines are not counted in the provided network data. Certain transit networks match the technical level and service standards of metro systems, but reach far out of the city and are sometimes known as S-Bahn, suburban, regional or commuter rail. These are not included in this list. Neither are funicular systems, or people movers, such as amusement park, ski resort and airport transport systems. This list counts metros separately when multiple metros in one city or metropolitan area have separate owners or operating companies. This list expressly does not aim at representing the size and scope of the total rapid transit network of a certain city or metropolitan area. The data of this list should not be used to infer the size of a city’s, region’s, or country’s rapid transit systems, or to establish a ranking. Doing so would in many cases lead to a gross misrepresentation. Each rapid transit system consists of one or more lines— each line is a specific route with trains stopping at all or some of the line’s stations. Most systems operate several routes, and distinguish them by numbering, names and colors. Some lines may share track with each other, or operate solely on their own right-of-way. Often a line running through the city centre forks into two or more branches in the suburbs, allowing a higher service frequency in the centre. The capacity of a line is obtained by multiplying together the car capacity, train length and service frequency. Heavy rapid transit trains might have six to twelve cars, while lighter systems may use only three or four cars. Cars have a capacity of 100 to 270, varying with the seated to standing ratio—more standing gives higher capacity. The minimum time interval between trains is shorter for rapid transit than for mainline railways owing to the use of block signaling: the minimum headway might be 90 seconds, which might be limited to 120 seconds to allow for recovery from delays. Typical capacity lines allow 1200 people per train, giving 36,000-75,000 people per hour. 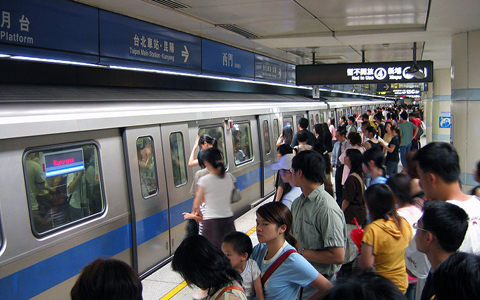 The highest attained capacity is 80,000 people per hour by the MTR Corporation in Hong Kong. As of October 2014, 157 cities in 55 countries around the world host the approximately 160 metro systems that are listed here. The London Underground, first opened as an “underground railway” in 1863 and its first electrified underground line opened in 1890, making the London Underground the world’s first metro system. 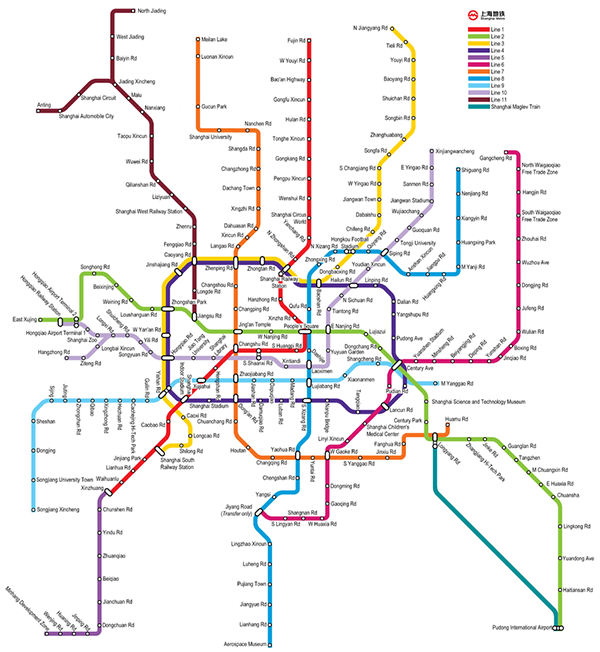 The metro system with the longest route length is the Shanghai Metro; the busiest one is the Beijing Subway; and the one with the most stations is the New York City Subway.